In the past H.A.C.K. has always bought in the hay that is needed for the Hay winter fodder for all the horses, but a few years ago our regular supplier badly let us down and sold our reserved hay to someone else who had sneakily offered a higher price. 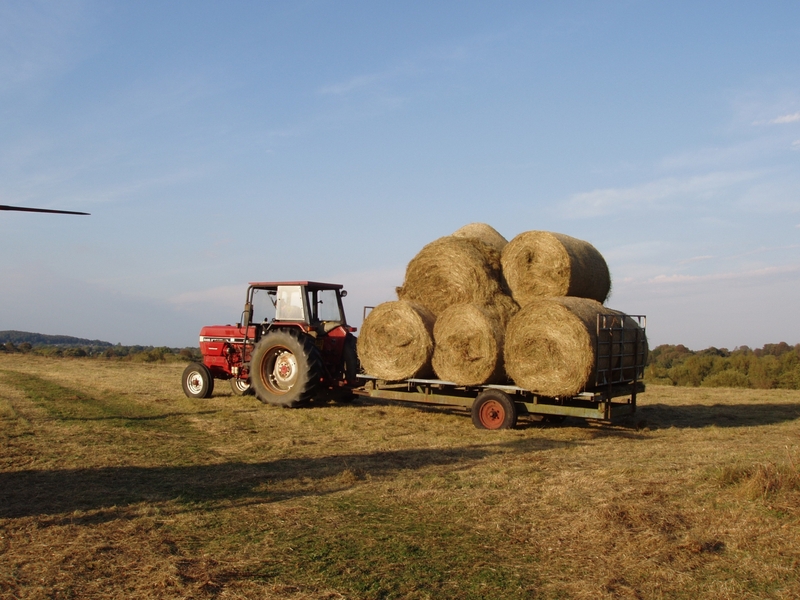 So we struggled to get the quality of hay that we give our animals that year and as it had been a bad winter, prices were getting high at £4 per bale, and as we use over 2,000 bales each year, that’s quite a lot of money. 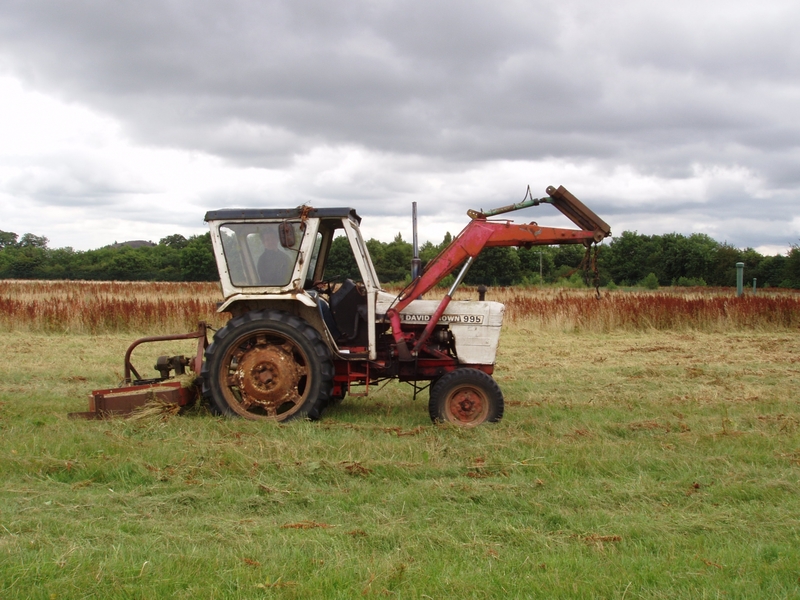 The first year with our old tractor, on a trial run on council land. 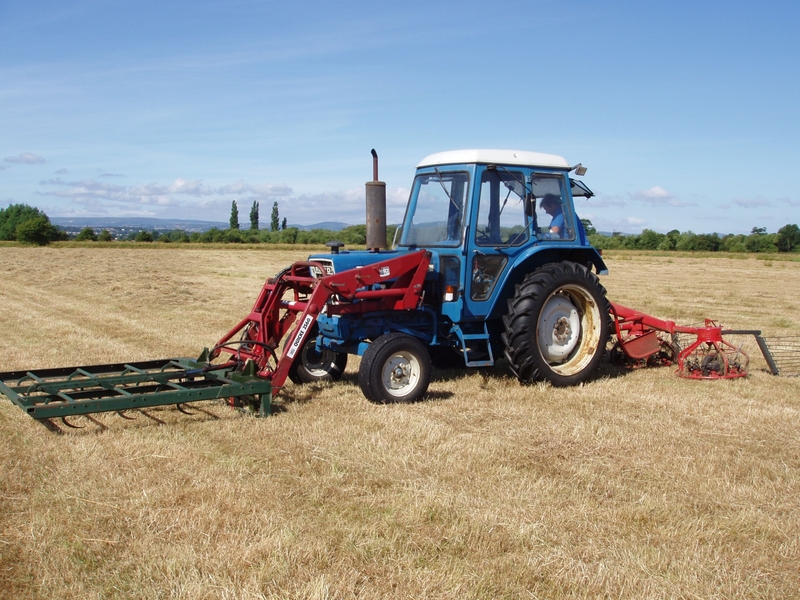 The first field we did was on the top park, there was about 5 acres of reasonable hay, but with a bit of dock, so we thought we would have a trial run, the council wanted this clearing so they could use the field as a car park for the annual run for life event for Wrexham. Actually we did quite well, with just five of us who turned out we managed to clear the whole lot within a week and though there were only 350 bales we were quite pleased. We had had a problem with the knotter on the baler, but all in all it wasn’t too bad. We awaited fine weather for our next field, so you can imagine our surprise when we found someone in there already cutting it, after a few words we discovered that someone had asked him to do it who had no authority to do so, so now we had to go in and make hay whether we wanted to or not. 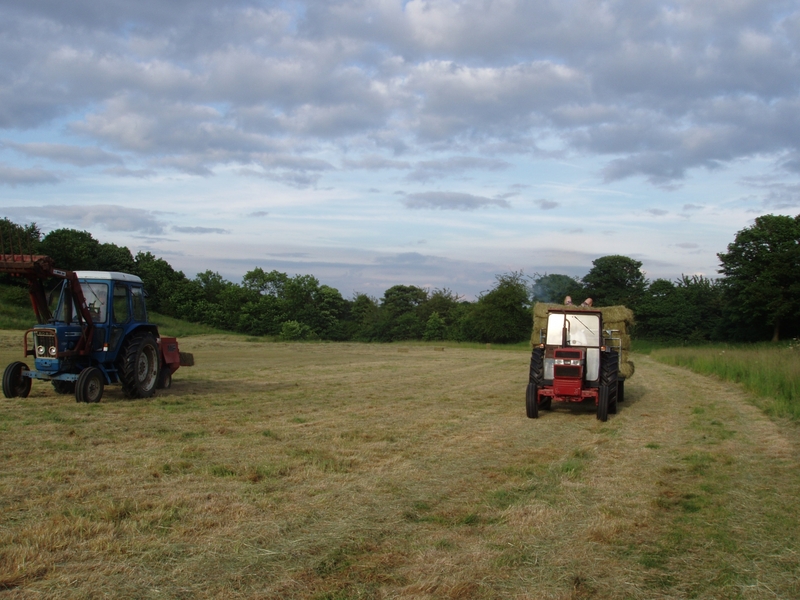 All went well until the baler broke down, the hay was dry, turned and ready for baling, the weather was scorching and hitting 30c, we were exhausted, Bill battled to fix the baler but the knotter would not knot and a large bang told us the shearing pins had broken. On the Tuesday right the weather forecast was for heavy rain the next day....I could have cried, who’s stupid idea was this....however, have a little faith, because Pip’s mate Johnny came to our rescue and started baling on the Wednesday morning. The mechanic also turned up and fixed the baler, so it was all steam ahead. Johnny lent us his trailer and with my horse box and Bills big van we managed to load it all up before the rain set in...Phew..that was close. 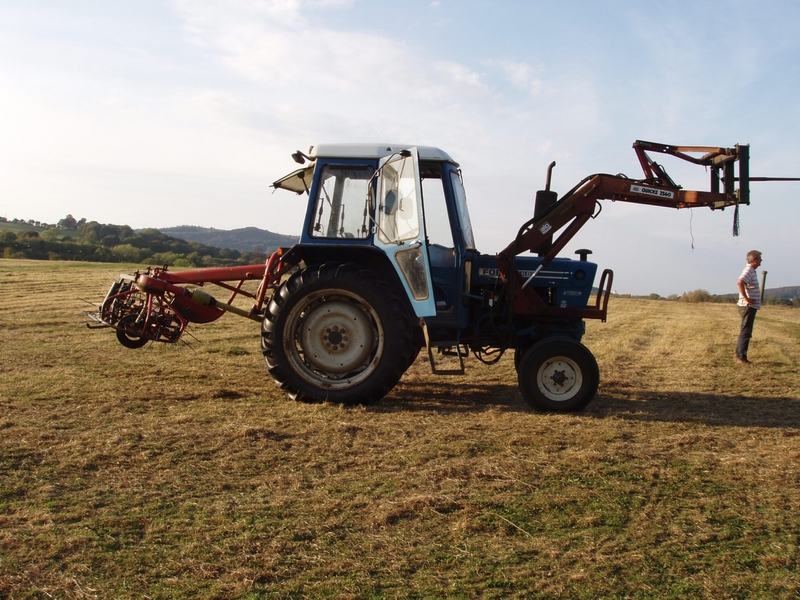 managed to buy another tractor so I was quite surprised when Bill came back in a real bad temper, the mower had broken and he had left the machinery in the field!!! Pip and I went down to see what had gone wrong, the top arm that joins tractor to mower had been damaged and the next day being Sunday the agricultural place was closed, so Pip went along to see another mate who just happened to have the spare part we needed and fixed it for us, he had been half way through cooking his Sunday lunch, but being a farmer himself knew of the stress that making hay causes. The good thing is, the baler worked and seven days after mowing all the hay was in. We again borrowed Johnny’s trailer and Pip ferried back and to whilst Bill carried on Baling. Janie, myself and Pip unloaded and stacked the hay at the sanctuary and again the high temperatures nearly did for us. 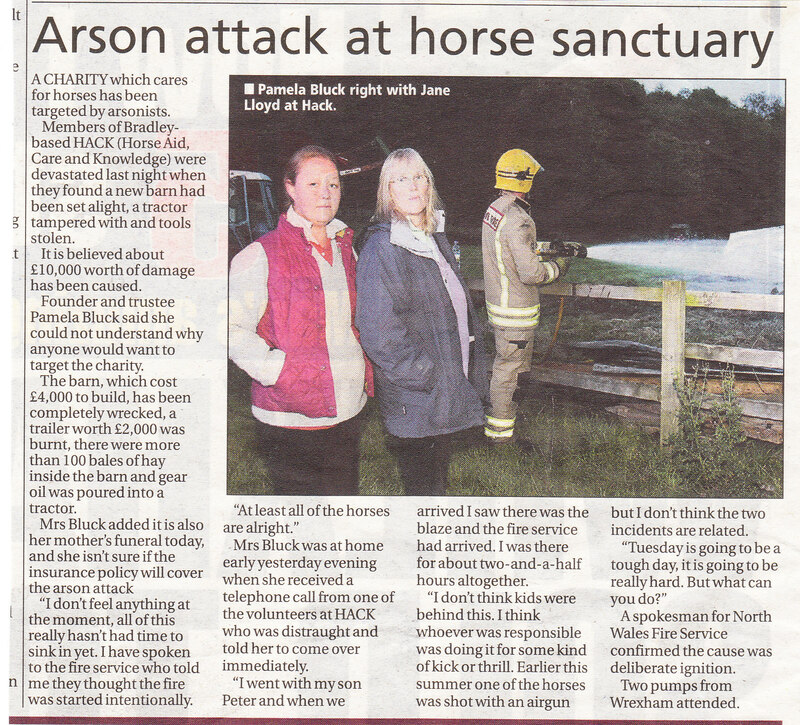 But we had made more than 2,000 bales of hay therefore saving the sanctuary a small fortune. that is ..................until next year!! We have now been making hay for several years and we have had good years and bad years but up until now have always manage to get all the hay made that is so necessary for the winter feed. We no longer do the the Wildlife Trust land, as it often floods being near the river Dee but we managed to aquire land nearer home just for hay making. I also went along to a farm sale and bought our own hay trailer, what an experience, but that’s another story. We always need strong and fit volunteers at haymaking time. Are you up or it? 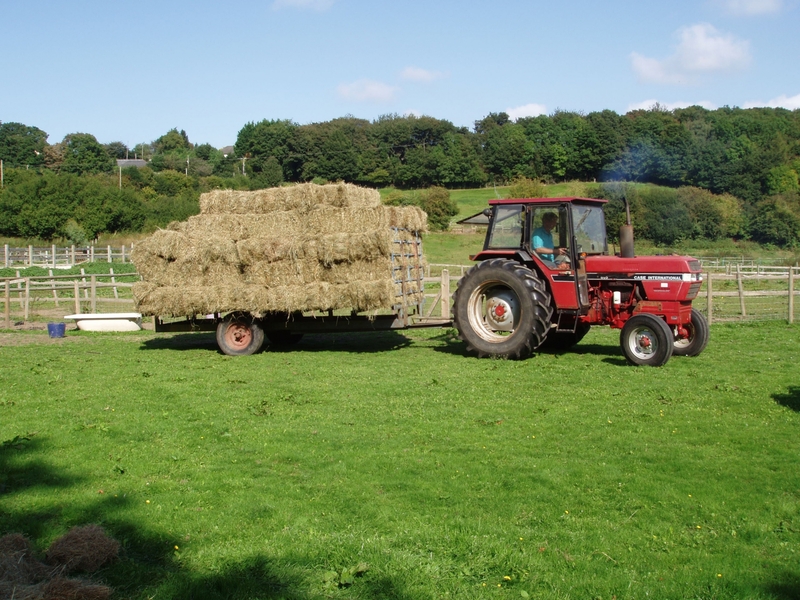 The Sanctuary needs approx 2000 bales of hay to get through the winter, sometimes me make haylage and large round bales, but by making our own hay we save H.A.C.K. between £6-8000 per year.